Byzantine Tagmata: The Roman Army at Dyrrhachium included Thracian and Macedonian Tagmata, which numbered about 5,000 men. Dyrrhachium (Durazzo to Italians, Epidamnos to Greeks) was the capital of Illyria, and is modern Durres in Albania. Robert Guiscard and his son Bohemond besieged it in 1081 in the Norman attempt at Mediterranean expansion against Byzantium. Guiscard left Otranto with a fleet and army in May 1081. 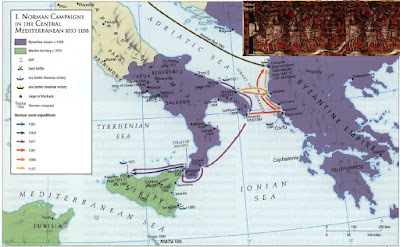 A Venetian fleet allied to the Byzantines to defeat the Normans in June, after the Normans suffered damage in a storm. Guiscard could not blockade from the sea as intended. The siege was an attempt by the Normans to gain safety within. The defence was led by George Palaeologus. The Normans built a belfry, countered by a wooden tower and later destroyed by fire. The defenders used catapults, pitch and Greek Fire. The Normans suffered illness and starvation. Alexius I Comnenus came to the relief. The battle was fought on 18 October. Against the odds the Normans won through using archers and cavalry against the Varangian Guard (including Anglo-Saxon exiles). Guiscard's wife Sigelgaita participated in the ensuing battle, brandishing a spear and helping to rally the troops. Alexius was wounded in the forehead but escaped to Ochrid. The Byzantines retreated and Dyrrhachium surrendered on 21 February 1082. Guiscard returned to Italy. Bohemond continued to Larissa where he was defeated by the Byzantines. Oman, p. 164, reports in detail on this battle because he sees in it the last engagement for 300 years in which actual foot troops like those of Harold at Hastings, and not dismounted knights or simple militia or marksmen, played a role, the last battle between the Anglo-Saxon battle-axe and the Norman lance supported by the bow. Robert Guiscard had crossed the Adriatic and was besieging Dyrrhachium (Durazzo). Emperor Alexius moved up with a relief army that also included the Varangians who were in the service of Byzantium. Anna Komnena, 6: 6, describes these men who carried double-edged swords or battle-axes on their shoulders, as well as shields. She recounts that they dismounted from their horses and attacked the Normans in a closed formation. Initially, she reports, they had also thrown the Normans back, even though they did not wait until the mounted archers had worked the enemy over. But in this action they had become separated from the rest of the Byzantine army and were overcome by the Norman horsemen. This description does not correspond as closely to the conduct of the thanes at Hastings as it does to the ancient German wedge. For the thanes at Hastings sought to win in a purely defensive action, while the Varangians at Dyrrhachium attacked like the ancient Germans. But why did they dismount from their horses? The result shows that they were too bold in their attack. Perhaps it was only a question of insufficient cooperation with the other units of the Byzantine army. But since we are not clearly informed on this point and Anna Komnena is not such a reliable source, this battle can hardly be evaluated from the viewpoint of military history. The other sources, too, which report on this battle, particularly the Gesta Roberti Wis-cardi (Deeds of Robert Guiscard), Mon. Germ. SS., 9. 369 ff-, do not provide the answers to those questions. 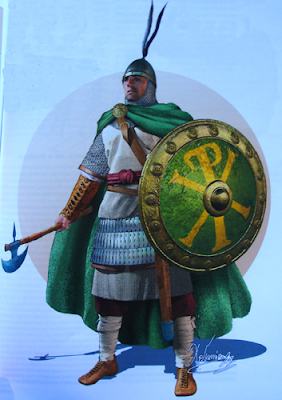 Prince from 1098 through the First Crusade, the son of Robert Guiscard and Alberada. Anna Comnena described the impact on the Byzantine court (and herself) of the tall, muscular, stooping, blond Norman. He fought for his father against the Byzantines in the unsuccessful attack on Albania in 1081. His younger brother Roger received the Apulian lands, and Bohemond inherited little. On the First Crusade, leading the Normans from Sicily, he fought at Dorylaeum and Antioch. The author of the Gesta Francorum was probably in his retinue. Bohemond founded the principality of Antioch despite Byzantine claims, but by the Treaty of Devol in 1108 recognised Byzantine overlordship. He was captured by the Turks near Aleppo in 1100 and imprisoned in Anatolia until ransomed in 1103. He was defeated by the Turks at Harran in 1104. He returned to the west in 1106, seeking reinforcements, and married Constance daughter of Philip I of France. With a new force Bohemond besieged Durazzo from 1107 but failed to take it. He returned to Italy and died in Apulia. His nephew Tancred and then his own son Bohemond II succeeded to Antioch. Emperor from 1081, restoring much imperial territory. He was emperor during the First Crusade and the hero of his daughter Anna Comnena's Alexiad. His wife was Irene. He commanded armies before becoming emperor and was an able diplomat. He succeeded through a coup against Nikephorus III. 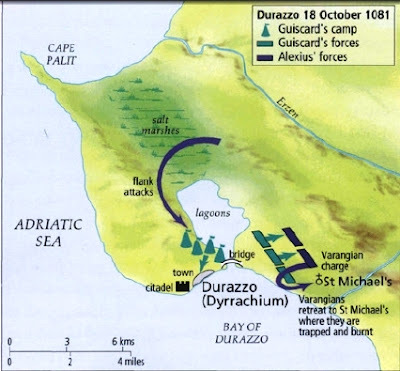 He faced attacks on Byzantine territory by the Italian Normans under Robert Guiscard, including an attempt on Durazzo that was held off. He defeated the Pechengs at Levunium. He employed Turkish mercenaries and allied with Venice, to whom he granted privileges. Alexius recovered territory in Europe. He rebuilt the navy, regaining Crete and Cyprus. He manoeuvred the Franks on the First Crusade through his territory and into Asia Minor. As a result of the Crusade's success he recovered much of Anatolia from the Turks. He received some recognition from the new crusading states. His son John II succeeded.